I LOVE the fall! The fall in the Washington DC is particularly stunning. Anyone who has driven down the George Washington Parkway in October knows how beautiful autumn is here. So, I am always excited when I begin to notice the chill in the air and see the leaves starting to turn bright shades of yellow, orange, and red. The change in season inspires me to get creative and think up some easy DIY Halloween decor! I am ALL for decorating during the holidays, including Halloween. This year will be the first holiday season that we celebrate in our new apartment. Apartment living is wonderful, but we’ve had to make a few adjustments after living in a spacious single-family home in Florida. We decided to make the switch to an apartment when moving to Maryland for many reasons, including the chance to be walking distance to a metro station, restaurants, and shopping. The major tradeoff is a drastic downsize in storage space! 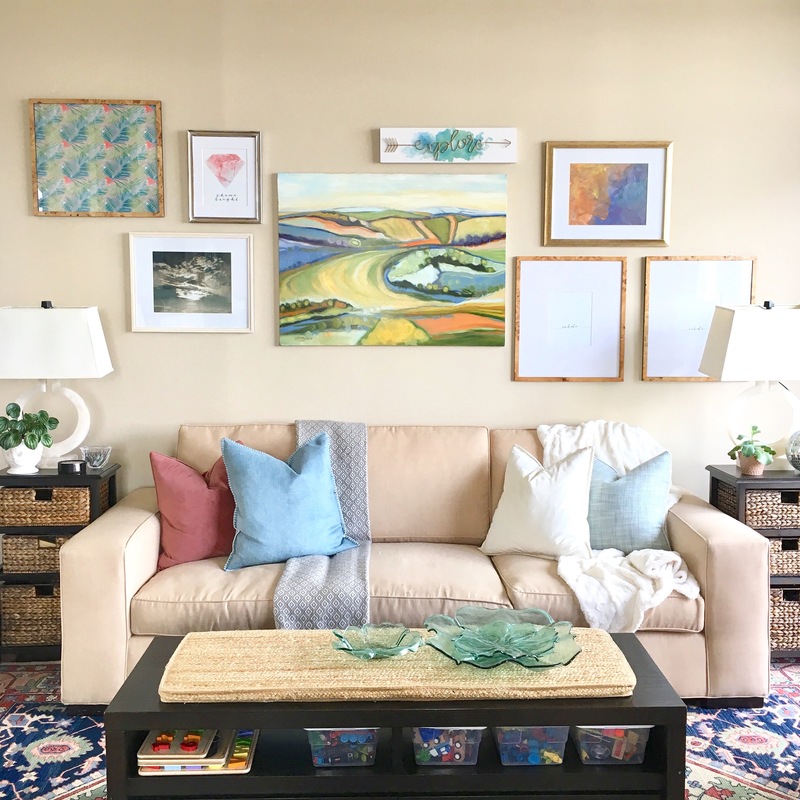 I learned how important it is to stay on top of all the stuff that accumulates in a home because clutter can quickly become overwhelming in a small space. Cue Halloween and the start of my favorite time of year. I knew that I did not want a ton of extra items out. It was time to consider what Halloween pieces I really loved and in what area they would have the biggest impact. After standing in my entryway, I decided to focus my energies here. It needed some sprucing up anyway, and this is also the spot that trick-or-treaters would enjoy! First up, I decided to update the entryway table. The basket ended up here when there was no other space for it, and it quickly became a catchall. No thanks. Basket is gone and now I had room for a few of my favorites. I purchased the light-up cat and lantern from Pier One a number of years ago. My son picked out the white pumpkins on a recent trip to Butler’s Orchard. The “flowers” are actually super cool and funky napkin ring holders, repurposed and displayed in two small mercury glass vases. The mercury glass votives hold flickering candles (LED of course, because I have a toddler and a real cat!). Throw in a Happy Halloween sign and an extra pumpkin and the table is complete! Simple, yet festive! A quick and easy Halloween display to get us in the spirit! Now, however, the rest of the hallway seemed decidedly, very un-Halloween. I needed an easy and budget-friendly artwork update! So I decided to create some spooky art of my own! Art inspiration can come from anywhere – including a Halloween themed paper garland! I already owned two of these paper bat garlands, but this year, I wanted to use them in a new way. I removed the string that ran through the garland and carefully pulled apart a few of the bats where they connect at the wings. Now I had rows of bats to display in my artwork. Next, I covered my existing framed pieces with either light-gray or white drawing paper, creating the perfect backdrop. I adhered the paper to the framed glass with a few loops of regular scotch tape because I knew this would be easy to remove after Halloween. By placing the bats on the diagonal, they direct the eye inward and welcome guests who enter! Paper bats set on the diagonal create the illusion of movement and direct the eye inward. Our framed piece in the middle was much larger than the others in the hallway. It would need a piece of poster board to cover most of it and even then, a bit of the existing navy blue matting would still be visible. The navy did not go with my new black, white, and gray Halloween color scheme. Then, the idea came to me: time to give it the school bulletin board treatment. I actually already had some of the bulletin board border strips in bright green from a past craft project. It was easy to use the border as a template and cut my new design out of matte black wrapping paper. I found the center skull design at Michael’s when I went in to purchase the piece of poster board. The felt material of the skull design easily adhered to the poster board with regular craft glue. Three pieces of art complete! I couldn’t help but think of contemporary artist, Damien Hirst, when creating this skull and crossbones design. Next up: covering my black and white print! Luckily, the framing already coordinated with the Halloween colors and it added to my overall design. Here, I was channeling my inner Damien Hirst (contemporary artist and king of the slightly off-putting and macabre) with this skull and crossbones design. The skull and bones are actually the deconstructed pieces to another garland that I already owned. Finally, I had enough bats to do one more bat artwork on the other side of the mirror. I love how the paper-thin wings seem to flutter off the paper! And there you have it! My new Halloween entryway! I am very pleased with the results. I particularly love that after this Halloween, I can take down the “artwork” and keep it safe in a portfolio until I am ready to “hang” it back up next year! Happy Halloween! And happy decorating! Lauren, I love what you’ve done! It looks Spooktacular! Thanks Suzi! It was so much fun putting it all together! Hope you had a fun Halloween!